Coll. No. 1467, 29 June 2016, characters observed: Perennial herb, to 30 cm., glandular hairy, sometimes tangled, more dense distally; Leaves, cauline, alternate, sessile, 35 mm. × 4.7 mm. wide, some entire, some with pair of lateral lobes; Bract, subtending flower, 26 mm. × 11 mm. wide, ovate, entire, or 1 pair lateral lobes, green becoming reddish-orange distally; Calyx, 22 mm. × 6.5 mm. wide, tube 12 mm. + lobes 10 mm., upper and lower lobes ±equal, color unremarkable, except reddish at tip; Corolla, 30 mm. upper lip(s) 9 mm., lower lip, 3 short teeth, 3 mm. 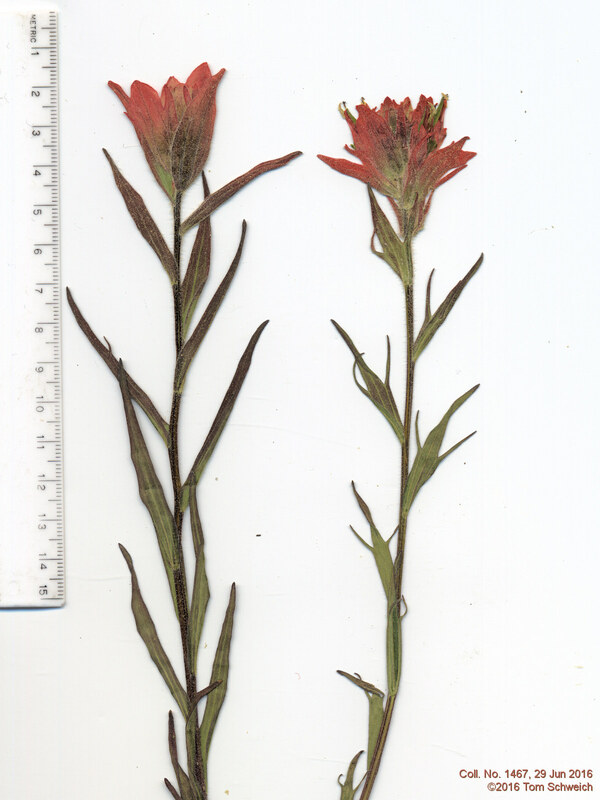 Does not fit easily into any Castilleja recognized in Colorado. Most like C. miniata or perhaps C. miniata × rhexifolia. Field Notes: Coll. No. 1467, 29 Jun 2016. Other photos about Species or Orobanchaceae Castilleja miniata.